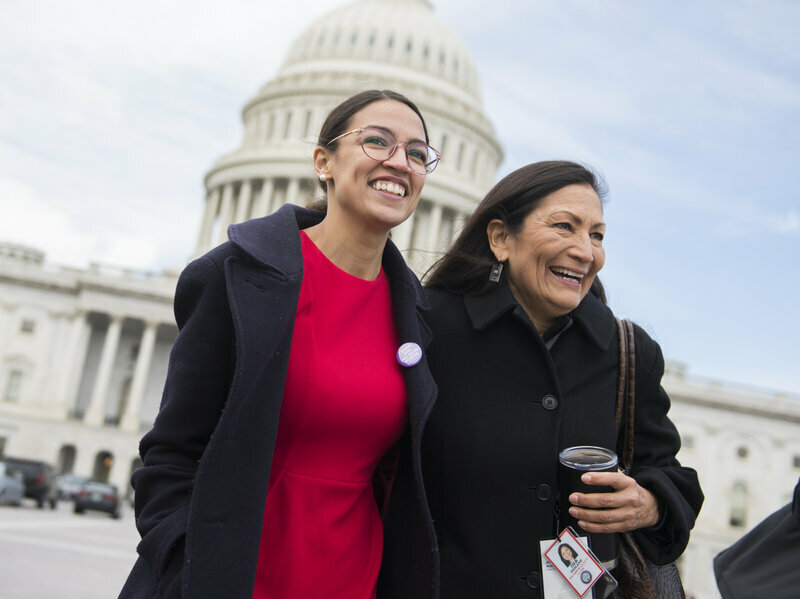 Alexandria Ocasio-Cortez is kicking @$$ in Washington D. C.
For most of American history, the federal government in the USA, including its Congress, has been a haven for elitist jerks with no interest in relating to the average American. Most members of Congress are millionaires, after all. Enter Alexandria Ocasio-Cortez, a young New York woman who was a waitress only a year ago, but who this year upset all expectations by overthrowing a member of the Democratic establishment in the primaries and then went on to win a seat in the House of Representatives. And what is she doing now to change things? New Congresswoman Will Pay Her Interns $15 An Hour. Is That A Big Deal? When Alexandria Ocasio-Cortez takes office next month, representing New York’s 14th District, she will be a part of the “blue wave” of new Democrats in the House. But the 29-year-old may end up being a part of a different kind of wave, too: a bipartisan effort for members of Congress to pay the interns they employ. “Time to walk the walk,” she tweeted on Tuesday. “Very few members of Congress actually pay their interns. We will be one of them.” And she pledged more than just a stipend: Her interns will make $15 an hour. The numbers are a bit better on the Senate side: Half of Senate Democrats pay their interns at least a stipend, while 55 percent of Senate Republicans do. As for the $15 hourly wage, only three members of Congress currently pay their interns so well, Creamer tells NPR: Sen. Bernie Sanders, I-Vt., Doug Jones, D-Ala., and Rep. Adam Smith, a Democrat from Washington state. In the for-profit world, the Department of Labor’s rules on paying interns have been clarified in recent years to state that that an intern must be the “primary beneficiary” of the internship, rather than the company. If the company is the primary beneficiary, then that intern is really an employee, and employees are entitled to minimum wage and overtime. But those laws exempt internships at nonprofits and in the public sector. Thus congressional offices are not obligated to pay interns, and often, they don’t. The House and Senate both passed bills earlier this year appropriating money for intern pay. The House approved $8.8 million, giving each member’s office $20,000 per year to pay interns. The Senate version includes $5 million, to be allocated according to a state’s population, providing an average of $50,000 per office. Despite those new pools of money, most members haven’t started to advertise paid internships, Creamer says, because they’re waiting for new guidelines about using the funds. And that’s an issue, because the congressional offices are accepting applications for the January class of interns right now. Whether an internship pays has a profound effect on who is able to apply for and accept it. Young people without wealthy parents or a university footing their expenses may find themselves juggling second or third jobs in the evenings after their internship. But a congressional internship can be an important step toward future opportunities in government or elsewhere. If such positions are open only to children of the wealthy, then the wealthy will very likely continue to be overrepresented as public officeholders. As Congress prepares for the next session, Creamer urged its members to start making plans for paying their interns — something his organization is more than happy to assist with. You’d think with slavery having been abolished after the American Civil War, unpaid interns would already have been illegal, and in any case, it should be. Ocasio-Cortez should be only the beginning. Over the next few decades, more and more young people need to vote out the establishment members of Congress of both the Democratic and Republican parties and replace them with members of the working class that are like themselves. Then we will truly have a government of the people, by the people and for the people. And NO ONE should be in Congress for several decades anymore! Such power entrenchment is a disgrace! Remember this blog entry from several years ago? One of the biggest problems with our modern society is the limited vision far too many people seem to have and their unwillingness to look beyond that vision and outside their comfort zone to see all of reality and what it involves. For example, the average white person in the USA rarely deals with black people on a personal level and thus has no idea of how racism affects blacks on a frequent basis. Because their dealings with police are usually pleasant or at least respectful, they assume that blacks are treated the same way by police. So when they hear of cops shooting unarmed blacks, they assume that the black suspect must have provolked the cop in some way. But even if that were true, being defiant towards a cop should not merit the death penalty, so the excusing of the killings is racist on its face. Let me emphasize one important point about those in the media who defend the political status quo and those who are privledged because of that status quo; they are ALL liars. Because those in power want to feel comfortable about their power, these media thugs rush to tell their followers what they already assume to be true, thus the followers express confirmation bias rather than looking for objective truth to take all the facts into account. Rush Limbaugh is a liar. Ann Coulter is a liar. Bill O’Reilly is a liar. Shawn Hannity is a liar. Michael Savage is a liar. Dinesh D’Souza is a liar. I could go on with dozens more names of media personalities as well as hundreds of names of officials in our various federal, state, and local governments, but you get the point, right? And what are all these different conservatives lying about? One basic concept, which can be summed up as follows. Doesn’t that sound like self-serving cowardice to you? In the 1960s, there was a tremendous struggle over civil rights for blacks in America, especially in the south where they were kept in dire poverty and even denied voting rights in most cases, as well as cut off from the same opportunities whites enjoyed. The U S Supreme Court ruled against these racist institutions and forced most of them to change. Afterwards, most whites across America thought the racial problems had been solved. But the white supremacists, while they were down, were certainly not our and they began to strike back. Indeed, I have come to believe that the Religious Right of the 1980s and the Tea Party that rose up in response to Barack Obama becoming President were both scams that enabled white supremacists to sneak into and take over the Republican Party and then through that to grab control of the entire political apparatus of the United States federal government, not merely taking back control of the southern states. And with Donald Trump they have finally succeeded. Why is conservatism so harmful to society? Because human nature is corrupt and abusive. When people allow themselves to act according to their default biological programming, the result is always tribalism, the placing of members of your own group above outsiders instead of promoting equal justice for everyone. Ironically, Christianity, which most American conservatives claim to believe in, teaches this very thing, that we are all sinners who can’t be trusted to control ourselves without guidance from above. However, it is clear that even authorities in conservative forms of Christianity can’t always be trusted; they promote religious bigotry rooted in the past instead of ethical standards that fit the real needs of real people in this present age (ironic, considering that Christianity itself started as a rebellion against Jewish legalism). That’s what secular humanism does. And democracy is a humanist ideal. Whenever people believe, for any reason, that society is good enough and needs no improvement, they actually open the door for society to become corrupt and abusive later; the only sure way to protect the people is to constantly look for ways and means to improve society. I am therefore a champion of “perpetual revolution”; the American Revolution of the 18th Century was only the beginning of reforms and progress and should never end as long as we have viable societies of any kind. There should be NO place whatsoever for Conservatism in American politics, period. To be consistent, the aforementioned conservatives in the media should be bowing down to the British government that Americans rebelled against in 1776, but they don’t because they are hypocrites. Sinéad O’Connor is taking her commitment to her new religion one step further. The 51-year-old “Nothing Compares 2 U” singer, who now goes by the name Shuhada Davitt, shared in a series of tweets early Tuesday that, a few weeks after officially converting to Islam, she wants to avoid everyone who does not share her spiritual beliefs. If her spiritual orientation is indeed Islamic, by all means she should embrace it. But this sounds like bigotry against non-Muslims. How can you promote the virtues of Islam except by interacting with non-Muslims to show them how good the religion is for you? Then, O’Connor called into question the social platform’s policy about blocking hateful content. “Interesting to see if Twitter bans this when it allows people like Trump and Milbank spew the satanic filth upon even my country,” she said. The musician also addressed the role of violence in Islam, Judaism and Christianity. O’Connor is a known critic of the Catholic church. If the violent stories in the Quran are indeed irrelevant to our times, why would anyone assume that the dogmas and rituals associated with Islam are relevant to this present day? Does simple logic not occur to her? It is never crazy to care, but remember when you tore up that photo of the Pope on Saturday Night Live and the fallout resulting from that? That was a crazy stunt. And it seems you learned nothing from that failure. Demanding tolerance for your beliefs while being intolerant towards those who disagree? We have a word for that. I wonder if she ever considered the Baha’i Faith. A Baha’i could just as easily proclaim that “all scripture leads to the Baha’i Faith. Which makes all other scriptures redundant.” As a Christian, I was taught that most of the “Old Testament” pointed to Jesus as the fulfillment of the Jewish covenant, which would have been an offensive thing to claim to any Jews that heard it. Well, as a non-theist, I think they are ALL wrong. There is no final religion, no perfect religion and no “true” religion. And no one can prove otherwise. That’s why we have so many religions and the many, many, MANY divisions within all of them. The day after revealing her big news, O’Connor shared that she had been given her first hijab, writing that she wouldn’t be posting a photo because it’s “intensely personal,” before humorously adding that there was a second reason for her decision. O’Connor was ordained as a priest in 1999 in a dissident Roman Catholic group. She has previously spoken out against the abuses of the Catholic Church, even ripping up a photo of Pope John Paul II during a Saturday Night Live appearance in 1992. The singer has struggled with her mental health in recent years, including suicidal ideation, yet said she was open about her issues in the hopes that it would inspire others suffering to seek help. And both should be ignored. What will it take to end the abuse? The American right is in the midst of a formidable project: installing permanent minority rule, guaranteeing control of the government even as the number of actual human beings who support their political program dwindles. Voter suppression is one, but only one, loathsome tactic in this effort, which goes far beyond just winning one election. Minority rule is the result of interlocking and mutually reinforcing strategies which must be understood together to understand the full picture of what the American right wants to achieve. Examples are everywhere. Take North Dakota. In 2012, Heidi Heitkamp, a Democrat, won a surprise victory in a Senate race by just 2,994 votes. Her two largest county wins were in the Standing Rock and Turtle Mountain Reservations, where she won more than 80% of the vote. Her overall vote margin in counties containing Native reservations was more than 4,500 votes. Observing that Heitkamp literally owed her seat to Native voters, North Dakota’s Republican legislature enacted a voter ID law that requires voters to present identification showing their name, birth date and residential address. There’s the rub: many Native voters do not have traditional residential addresses, so this law effectively disenfranchises them. Or take Georgia, where the Republican nominee for governor, Brian Kemp, is the secretary of state and in that capacity has placed more than 50,000 voter registrations on hold, many from urban areas with high black populations. That is in keeping with Kemp’s privately expressed “concern” that high voter turnout will favor his opponent – Stacey Abrams, running strongly to be the first black female governor in US history. Exacerbating voter suppression is the ongoing partisan gerrymandering effort – the redrawing of electoral maps to favor one party over another. After the 2010 census, the Wisconsin legislature (controlled by Republicans) drew a map for the state’s legislative districts explicitly designed to ensure they would retain control of the legislature even if they received a minority of votes. It worked: in 2012, despite receiving only 48.6% of the vote, they won 60 of 99 seats. Democrats won an outright majority of votes cast but secured just 39 seats. To this, Wisconsin added a voter ID requirement designed to make it harder to vote at all. Voila: voter turnout in the 2016 presidential election was the lowest since 2000 and Donald Trump carried the state. (To be sure, there were other factors at work.) The combined, national effect of partisan gerrymandering is such that in the 2018 midterms, the Democrats might win the popular vote by 10 points and still not control the House. Legislative maps designed to promote minority rule plus voter suppression of the constituencies opposed to it is a potent combination. And there’s more. The two most recent Republican presidents have entered office despite receiving fewer votes than their opponent in a national election, thanks to the electoral college, which systematically over-represents small states. (California gets one electoral vote per 712,000 people; Wyoming gets one per 195,000.) With the presidency in hand in the run-up to the 2020 census, minority rule will be further entrenched by adding a citizenship question to the census. This will result in systematic undercounting of the population in heavily Democratic areas, which will in turn further reduce their influence as legislatures draw maps based on the data. Then there’s the Senate. Because of its bias toward smaller, rural states, a resident of Wyoming has 66 times the voting power in Senate elections as one in California. Thus, in 2016, the Democratic party got 51.4 million votes for its Senate candidates. The Republicans got 40 million. And despite losing by more than 11 million votes, the Republicans won a supermajority (22 of 36) of the seats up for election, holding their majority in the chamber. The hideously malapportioned Senate and electoral college permit the last piece of the minority rule puzzle to snap into place: the supreme court. In 2016, after losing the contest for the presidency and the Senate by millions of votes, the Republicans were able to install two supreme court justices. There may be more. In fact, when the Senate confirmed Trump’s first nominee, Neil Gorsuch, it was a watershed moment in American history. For the first time, a president who lost the popular vote had a supreme court nominee confirmed by senators who received fewer votes – nearly 22 million fewer – than the senators that voted against him. And by now, it will not surprise you to discover that the senators who voted for the confirmation of Brett Kavanaugh represent 38 million fewer people than the ones who voted no. With the supreme court in hand, all those other tactics – partisan gerrymandering, voter ID and the rest – are protected from the only institution that could really threaten them. But it doesn’t stop there. The supreme court can be used to do more than approve the minority rule laws that come before it. It can further the project on its own. In 2015, the court came within one vote of holding that independent redistricting commissions (which reduce partisan gerrymandering) are actually unconstitutional. The swing vote in that case, Anthony Kennedy, is gone. And the court in 2013 famously invalidated a major portion of the Voting Rights Act which put checks on voter-suppression efforts of the kind now taking place all over the country. Taken together, this is a powerful set of tools. Draw maps that let you win even when you lose. Use the resulting power to enact measures to suppress the vote of the other side further. Count on a minority rule president to undercount your opponents in the census, and a minority-rule Senate to confirm justices who will strike down any obstacles to the plan. With the deck this stacked, it isn’t enough to win. Wresting control back from the entrenched minority will take overwhelming victory. It may take, in other words, a genuine political revolution. In short, the USA is becoming the 21st Century version of South Africa under apartheid. Which brings up the obvious question: Who will be the American version of Nelson Mandela? Who will be willing to fight, to be imprisoned, or even to die to put an end to the Republicans’ efforts to destroy democracy and freedom among us? Unless and until people of all colors, both genders, various religions and even different social classes are finally willing to rise up and OVERTHROW the Republican Party and its march towards fascism, we won’t have freedom, period. We can only truly be free if we fight for it. With the middle class in the USA almost completely broken down due to repeated tax cuts for the rich combined with the refusal to raise the minimum wage by conservatives, it is interesting that a recent song perfectly captures the ironic despair of their victims. The catchy nature of this song makes it even more effective.